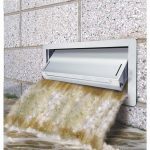 These vents are used for a home with a crawlspace or any enclosed area that desires natural air ventilation and flood protection. The vent door is latched closed until it comes in contact with flood water. Entering flood water lifts the patented internal floats which unlatch and allow the door to rotate open. This allows the flood water to automatically enter and exit through the frame opening, relieving the pressure from the foundation walls. Certified flood debris clearance is demonstrated with a 3 diameter opening when the flood door is activated. 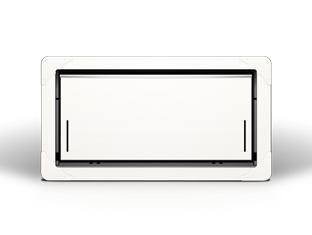 A bimetal coil automatically opens and closes the ventilation louvers as temperature changes. No electricity is required. The louvers will be fully closed at 35F and fully open at 75F. In the event of a flood the internal floats lift to release the flood door to rotate open and relieve the hydrostatic pressure regardless of the louvers’ position, open or closed.